Copyright: © 2017 MCLE, Inc.
Print Book 1390 pages in 2 volumes (printed book) with downloadable forms Note: For print books, with MCLE's supplementation service, new supplements and revisions are mailed automatically with an invoice. If you do not want to subscribe, please check the opt out option during checkout. The Massachusetts Zoning Manual provides comprehensive coverage of zoning law and developments and tracks key statutory and case law developments. It includes valuable practice insights on obtaining variances and special permits, appealing zoning decisions, drafting zoning options, smart growth planning, expedited zoning, and numerous other facets of representing clients in zoning matters. Regular supplementation and a spotlight chapter on Boston zoning are other features that make this book a necessity for real estate counsel, land use and municipal attorneys, environmental specialists—and general practitioners. Thank you for updating your library with the 2017 edition of the Massachusetts Zoning Manual. recent developments in Boston zoning, on topics including the Boston Redevelopment Authority's informal adoption of the name "Boston Planning & Development Agency"; an update on the planning process for a new citywide master plan; procedures governing refusal letters issued by the Inspectional Services Department; and judicial review of Board of Appeal decisions. 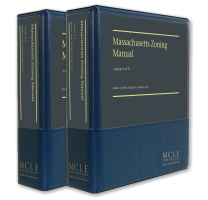 We trust you will find this revised version of the Massachusetts Zoning Manual an invaluable resource for your practice. Jonathan M. Cosco, Esq., Executive Office of Housing and Economic Development, Commonwealth of Mass.